Yesterday was a great Sunday, filled with relaxation, loved ones, and delicious food. My boyfriend and I ended up taking a nice little ride to visit his family. 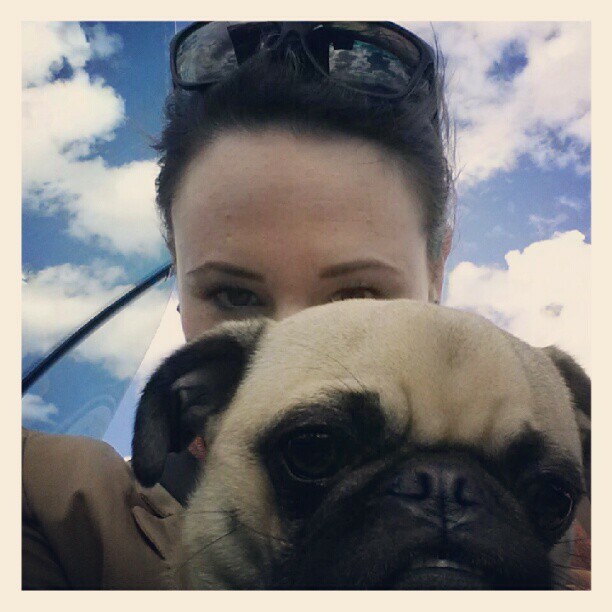 We had the top down on the car, the dog was on my lap, and the wind swirling around us. It was perfect and so refreshing! We ended up coming home with tons of deliciously fragrant basil and some of his mom's last tomatoes of the season. Yay for us! This is an extremely easy recipe, just add all of the ingredients to a food processor and process until smooth. And there you have it! A delicious homemade pesto that can be added to spruce up multiple dishes! To test out some of my new pesto I decided to make tortilla pizzas! Tortilla pizzas are one of my favorites, because they're simple, delicious, and easy to make. Cook at 400F until golden brown and crispy. For tortilla pizza # 1, I used whole wheat tortillas with my pesto, mozzarella cheese, spinach, onion, and the fresh tomatoes. Tortilla pizza # 2 included a whole wheat tortilla, pesto, swiss cheese, (a little) mozzarella, diced ham, onion, and a sprinkle of parsley. Try this pesto recipe and let me know what you think!